New York City is the greatest city in the world. For anyone that’s lived there, or even visited, this is an undeniable fact. But, did you know that the best, and easiest, way to become CPR certified in the New York area is through SimpleCPR.com? It’s true. SimpleCPR.com provides OSHA approved emergency training, including First Aid Certification, CPR Certification, Basic Life Support or BLS Certification, Bloodborne Pathogens Infection Control, and AED (Defibrillator) training. And, possibly the best part, the training is 100% online. That’s right, SimpleCPR allows you to become CPR and First Aid Certified from the comfort of your own home. Now you don’t have to worry about finding a testing center or waiting in traffic to get there. You can complete the online CPR training course, which usually takes between 30 – 90 minutes, in your pajamas if you want! And as great as New York is, we know that not everyone stays in the Big Apple forever. That’s why all certifications from SimpleCPR are internationally accepted. Your CPR and First Aid Certificate from SimpleCPR.com is valid for 2 years and is accepted in all 50 States, plus Canada, Puerto Rico, the US Virgin Islands, and many other countries around the world. 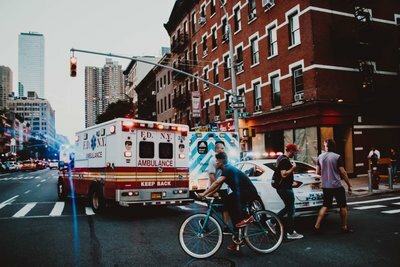 If you need CPR or First Aid Training in New York, there really isn’t a better option than SimpleCPR. Besides a CPR Certificate issued by the American Health Association, when you take a test with SimpleCPR, you’re also getting peace of mind. SimpleCPR has certified over 450,000 students to date, many of which have left a 5-Star review. And if that’s not enough, every CPR Exam also comes with a 100% Money Back Guarantee and offers unlimited retakes. SimpleCPR.com also provides group discounts and provides recertification exams too. Whether you are a nurse, social worker, physical therapist, personal trainer, teacher, foster parent, coach, lifeguard, flight attendant, or are in another profession in the New York City area that requires CPR or BLS certification, SimpleCPR makes it easy and affordable to obtain the certification (or recertification) you need.